The original concept was dreamed up by Lumley in the late 90s as a kind of commemorative design in the aftermath of Princess Diana’s death. The idea embodies values from popular culture, which were developed into a politically motivated earlier garden bridge project by the architectural studio FAT, which never took off however. Today the visual concept is imbued with glitzy symbolism and girly credentials as ‘a tiara on the head of our fabulous city’ as Lumley describes (in her best ab-fab pr voice) in this promotional video . But not everyone is convinced. In the video Lumley talks about the bridge as an ‘incredibly daring project’, which would rejuvenate the dead area between the Temple on the north side and the South Bank with its cultural institutions. The pedestrian bridge would certainly add some much needed picturesqueness to the concrete environment on the South Bank, where some greenery could greatly improve the slightly sinister feel of the area. Lasdun’s National Theatre building is beautiful inside, and what could be a more pleasant way arriving to the theatre than a stroll through a garden walkway over the Thames – quite spectacular, no doubt. In many ways the bridge project is the apotheosis of a certain type of romanticism in today’s urban planning. 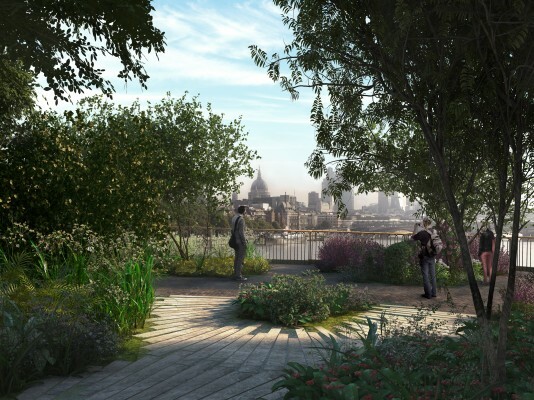 It is clear it would become one of the most popular meeting places in London, and as one of the bridge’s supporters relishes, it could be the ultimate romantic spot where “many proposals will take place”. It is an expression of the traditional British notion of the picturesque in the contemporary context. The need to break away from structures that are too rigid seems to underpin British culture. From William Morris to John Ruskin rebellion against forms and ideological concepts that are too rational, has always been part of British creativity. Modernist logic never really took off in the United Kingdom. In a vast city struggling with all sorts of transport problems it makes sense to question the strategic rationale behind the bridge. And would it spoil the unforgettable ‘Waterloo sunset’, no doubt one of the most stunning views in central London, others worry. In a city dotted with exclusive garden squares, the bridge promoted as ‘open for all’, from an idealistic neoliberal perspective, would certainly offer even better views.